Borage is an awesome ally for the nervous system, particularly from the *hypothalamus on down. Which makes me think that since the hypothalamus is connected to the pituitary gland, which is part of the endocrine system, it may also aid in emotional health and stress management. I mean we've all heard borage for courage, right? However, its usage should be minimal and respected and my takeaways from learning more about this powerful plant is that it's not wise to use it for long-term healing plans because of the toll it can take on the liver due to pyrrolizidine alkaloids that may be hepatotoxic to the liver. Especially important for folks with liver ailments to be aware of. 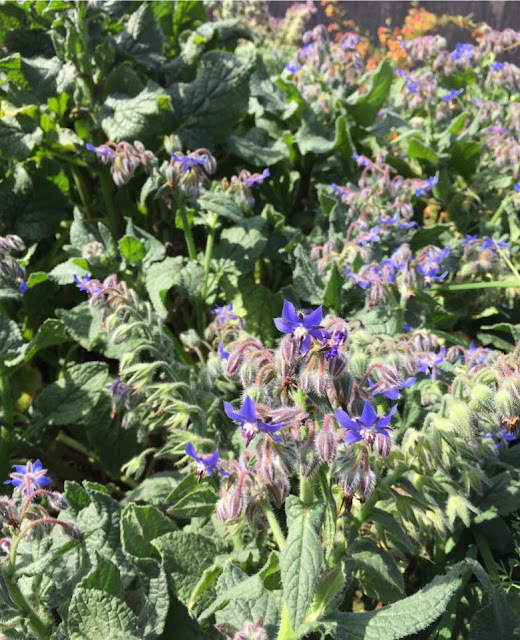 This is why we see borage being revered for its edible flowers and for its flower essence, nice gentle ways to harness this plant's healing power. Borage oil, from seed, is also a great form of medicine but takes lots of seed and one should ensure their oil is fee of PAs. I personally enjoy using borage very seldom as a floral syrup but my most common use is straight-up flower consumption or in an herbal vinegar with other herbs and small amounts of leaf and flower for minerals, mucilage, and for cooling and tonic properties. 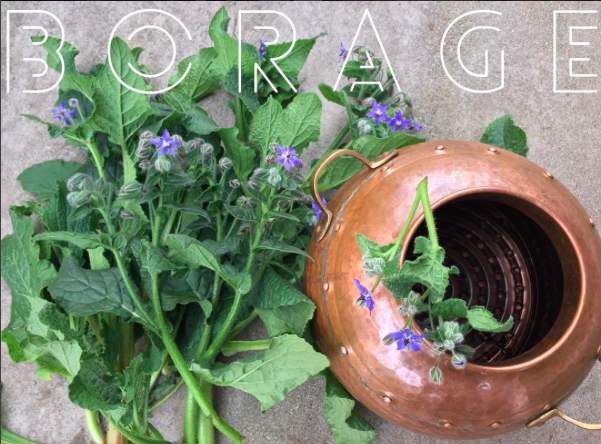 This repetitive usage caution inspired me to do a low and slow borage hydrodistillation with leaf, flower, stem and seed for a gentle form of borage medicine. A hydrosol made more so for its therapeutic qualities then aroma. The hydrosol in my learning experience turned out to be very cooling, calming and soaks up excess facial oil. Its cooling actions calmed heat in my face that has a pattern of building into infection by keeping pores open (without enlarging pores, it actually tones a bit), oils balanced, and blood cleansed. These breakout episodes can happen in high times of stress accompanied with exhaustion and possible hormonal imbalance. The plant’s growing patterns reveal a connection here. When Borage is faced with harsh hot and dry climates it will loose all of its hydration and will appear practically dead, but give its roots some water and the next morning will have you questioning whether or not you actually saw it lifeless. Also, borage flowers replenish their nectar rather quickly, this is why you see bees going back and forth between blossoms they've already visited. I feel these two traits speak greatly to the essence and medicine borage carries. The aroma is surprisingly sweet with, of course, a cucumber like aroma. Intrigued by this hydrodistillation I ended up experimenting with this hydrosol as a carrier for a borage flower essence. Which came out dreamier than expected! 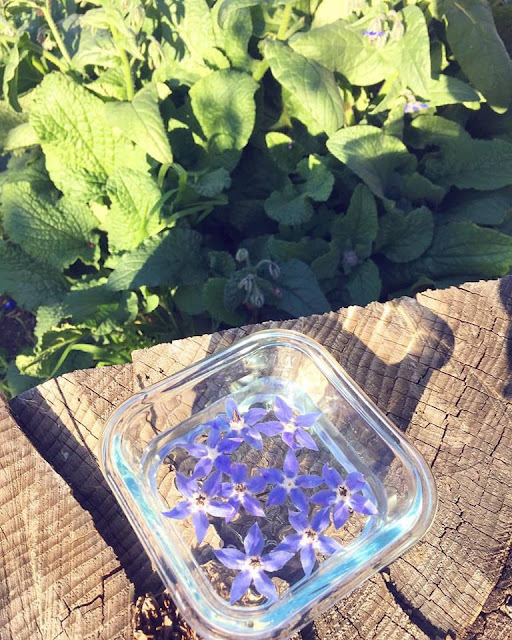 A gentle winter sunshine borage flower essence held in borage hydrosol and preserved with some local organic vodka. Some of the personal experiences I has this this essence, eases anxiety and a heavy heart, supports emotional (nervous system) exhaustion, dispels fear and invites positivity. Although, these plants/potions carry strong themes of healing attributes I believe each person receives different messages of healing tailored to their life and ancestral experiences. This is why building plant relationships is beneficial in one's healing path and journals (note-taking) comes in handy with this journey.